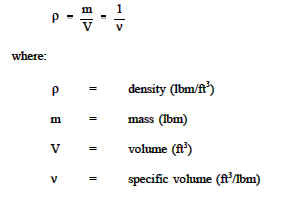 The density of a substance is the total mass (m) of that substance divided by the total volume (V) occupied by that substance (mass per unit volume). It has units of pound-mass per cubic feet (lbm/ft3). The density of a substance is the reciprocal of its specific volume (n).